Between graduation parties, moving daughter to new apt and crappy weather I have no new data to play with. 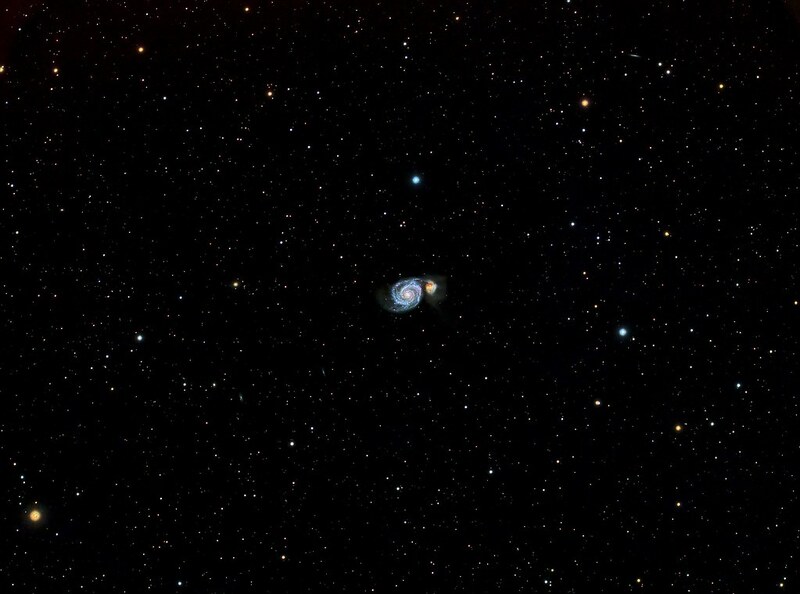 Been reading about drizzle so figured id give it a go with my M51 data which is pretty good. First pass was with my Lum data 250 frames worth. Since I have calibrated and weighted lights, the next step(after freeing up HD space I crashed Star Alignment)is to do a Star Alignment(Register) my 250 frames of Lum with the "Generate Drizzle data" checked. This outputs the .drz files in the same folder as the alighned subs. Once that's done, you integrate your lights, and add the .drz files to the integration. What this does, is it writes information to the .drz files, to be used in the next step. I actually crashed PI I ran out of memory at this step! (I did have a lot of work stuff open as well) so ran again took a really long time maybe 45 minutes to generate the integration image and update the .drz files. The final step is to actually close the integration image(its not used) and use the drizzle integration process and choose the .drz files that were updated. I noticed that these files started out as 12kb and are now various sizes from 4-7MB in size so quite a bit of information is written. Don't know enough abut process to speculate what's done. Curious if PI uses just the .drz files or if the drizzle integration uses the drizzle information as well as the frame(I do see references to the image in the .drz file) So I ran the Drizzle integration process with new files and that literally took over a hour to get through 250 subs. The results speak for themselves, I will show the differences as I progress through the rest of the stack but I was quite impressed with the difference! I suspect deconvolution will look really good! 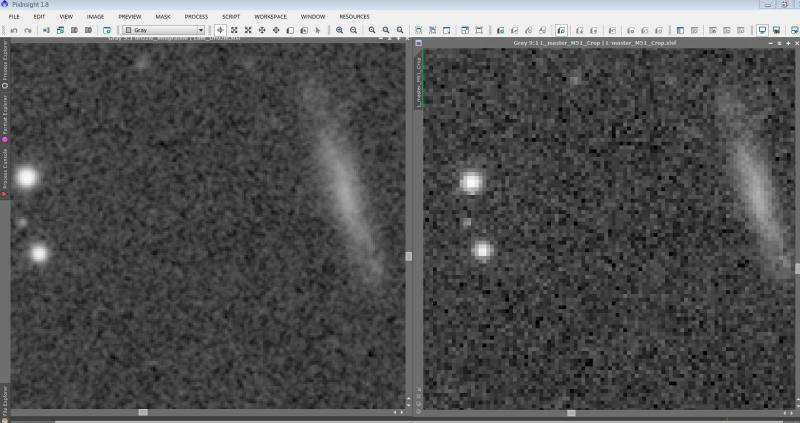 image on left is my LUM stack doing drizzle on right is my original stack with no drizzle you can really see the pixelization in the right image. Also the noise looks significantly different so I wonder how the whole processing steps will look? That's a nice demo. I've been meaning to try the same thing one of these days so thanks for the inspiration. Looking good! With that nice increase in image scale, I suspect deconv will work really well. 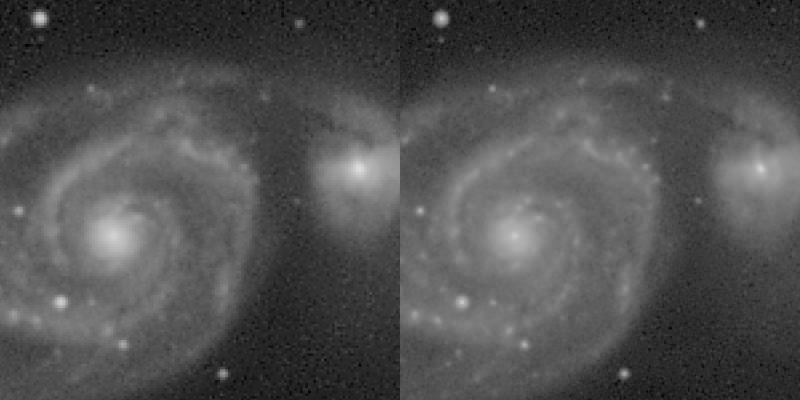 I highly recommend avoiding using a mask and instead use the regularization feature of PI's Regularized Richardson-Lucy to protect the noise and improve the resolution of those fainter, smaller galaxies. With a mask you will likely not get any improvement in the smaller stuff, but with regularization you should be able to improve all the details a bit. 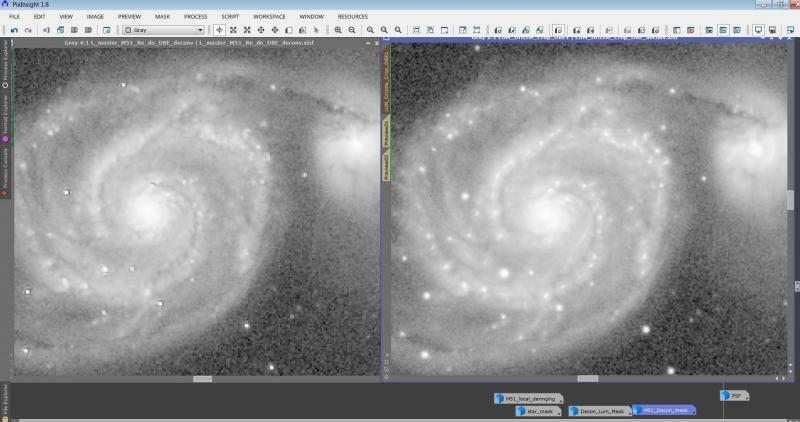 Excellent results, looks like a different image the stars actually look like stars not pixels from a game in the 80s. Looks like a good improvement for your data! The .drz files contain a pointer to the original image input to registration as well as all the rejection information. If you are rejecting a lot of data or just have a high pixel count those files can get really large. This is also why the files vary in size as one image may have quite a few pixels rejected while another does not. Ok so here is the no drizzle/drizzle comparison after de-convolution. On the left is the original with the square stars, right is the drizzled one, you can also see more stars and details in the bands as well. Honestly some of the original non drizzled sections look a little crisper but who knows how it will all shake out. Hopefuly when im done the image will be better than the original. This is approx. 4 hours of Lum 60 sec exposures gain 0 offset 10. So everything ive read I just do the de-convolution on the Lum correct? I still have to apply Jons TGV and MMT. Next ill be doing the RGB processing, adding Ha wondering if you can do de-convolution on the RGB+Ha data. I don't see why not but would like explanation of why I shouldn't. Your non-drizzled image has dark ringing around the stars, and looks a lot sharper. So the decon settings might not be optimal in both images. I've also experimented with Decon. 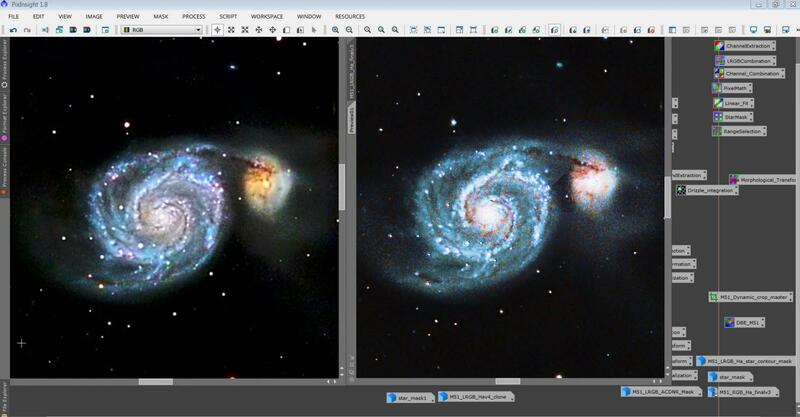 - Applied DBE, Deconvolution, MMT NR on the background, MaskedStretch and HDRWaveletTransform. - Decon was performed without a mask but with strong wavelet regularization. A starmask was used for local deringing support. The effect of deconvolution is mostly visible in areas with high SNR, stars and galaxy cores. Edited by cyber, 15 June 2017 - 04:14 AM. Ive tried various combinations of settings how many interations and they all look a little softer than the non drizzle image. There is definetly more detail in the drizzled and decon images my only thought is that without drizzle there are much sharper edges due to pixlization and it makes it look sharper. Unfortunately with my 80mm scope and reducer I am expecting miracles on a small DSO. I think this is about as good as I can expect with my scope and seeing conditions. At least I don't have square stars anymore! Are you willing to share your data? I could give it a whirl with regularization. You should indeed be able to bring out more resolution and crispness with drizzling and deconv than without. I really need to get a file sharing space my dropbox is only 2 GB and has a bunch of stuff. Anyway here is my final drizzled vs non drizzled im pretty happy with this. image on left is drizzle right non drizzle. Edited by miwitte, 19 June 2017 - 07:37 AM. Could you please elaborate on the non-masking method of Deconv? Yes. I have an in-progress article that will be covering it all. I have limited free time on my hands these days, so it's a little slow going getting all the necessary materials for a proper deconvolution article. Did you ever get around to writing this tutorial? Edit: Good write up. Your explanation of PSF is well written. 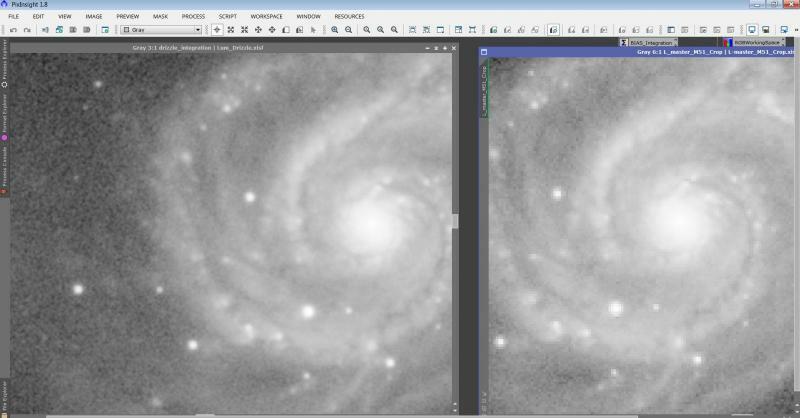 I have never used the synthetic PSF, and always go with moffat stars in DynamicPSF. One question though: the only stars I keep for my model are labeled as Moffat (no number). Are these too close to Lorentzian or Moffat15? Edited by HomerPepsi, 25 May 2018 - 02:57 PM.